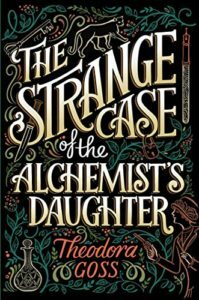 The September issue of Lightspeed magazine contains, among many other fine things, a column in which I review Theodora Goss’ The Strange Case of the Alchemist’s Daughter and Catherynne M. Valente’s The Refrigerator Monologues. These books make a beautiful double bill, and reading them back to back was intensely gratifying; they’re very much two sides of a coin where women’s anger is concerned, and I love them for it. Here’s a couple of quick sips from the column. After her mother’s death, Mary Jekyll faces down the reality of her sudden poverty: Orphaned, she is mistress of an empty house she can’t sell, without any income or the means to obtain one. But in the course of sorting her mother’s papers, Mary finds a strange account: Her mother had been making regular payments over the course her life to someone named Hyde. Recalling a hundred-pound reward for information leading to the whereabouts of Mr. Hyde, murderer-at-large, Mary enlists Sherlock Holmes’ help in unravelling the mystery—one that leads her to the daughters of other unscrupulous, scientifically minded men. Together they set about solving the Whitechapel murders—and room by room, Mary’s empty house fills up. Paige Embry is dead, but alive in Deadtown—an underworld mirror of New York City. She’s the president of the Hell Hath Club, a group of women who meet once a week in the Lethe Café to talk about their lives, to show themselves as more than their deaths. There, listening to gargoyle bands and drinking from empty glasses, Valente’s analogues of Gwen Stacy, Jean Grey, Harley Quinn, Mera, Karen Page, and Alexandra DeWitt tell familiar superhero stories slanted, from the perspective of the women who supported them, endured them, or invented the source of their super powers. It’s a passionate collection of anger, humour, and tenderness, told in a smooth, whip-cracking voice that’s equal parts wry stand-up and heart-breaking soliloquy. 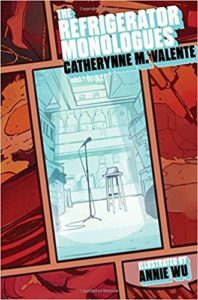 This entry was posted in Uncategorized and tagged catherynne m valente, lightspeed, novel, novella, review, reviewing, theodora goss. Bookmark the permalink.